This week, I went back to an Open Forum, taking any questions that came along through Reddit, Facebook, Twitter, Ink Nouveau, YouTube, and email. I ended up with more questions than I had time to answer, but I was able to squeeze in 19 before I had to run. I had at least 10 other good questions that I’ll save for a future Q&A. Is there any way Drew could make a guest appearance in the next video and talk about those two daily carry package sets I see in the new arrivals section? In particular – his thoughts on why he chose the Lamy 2000 for the writing set and the Platinum Modern Maki-E for the drawing set. These are 2 pens that have been on my radar for a while, so I would love to hear more about them from someone who writes with them all the time. Could you share something about your faith? In some of your videos I see that you’ve taken notes on Bible scriptures. I’m assuming you’re Christian but would definitely like to hear more about your faith. I always appreciate seeing families that are linked together with God in their lives. You seem to make an extra effort to be honest and impartial even though you sell the pens. I’m assuming that effort has something to do with your faith. I want to use a fountain pen to ink comics. I will likely have to use dip pens for most of the work, but for when I am lazy and don’t feel like dipping over and over, I bought a Noodler’s Ahab. I was wondering if there are any black inks that hold up well to erasing. I read a lot about which black inks are the blackest, but what is more important to me is that they remain black after erasing the pencil under the ink. 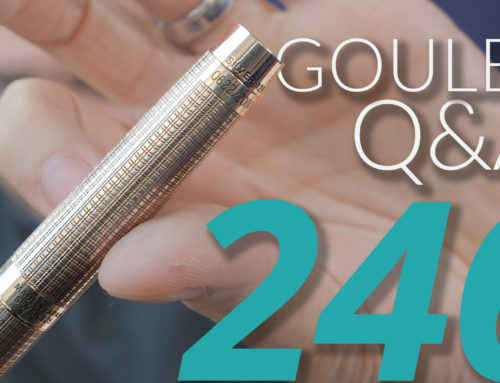 You mentioned in your platinum cool review that it is not advisable to use that pen as a converted eye dropper due to the metal inside…however, the TWSBI vac 700 has a metal rod as part of the piston…wouldn’t this also pose an issue (or is the rod in the vac a specially treated metal or a special metal in general)? If metal contact with ink over a long time is bad, why do nibs stand the year of time? 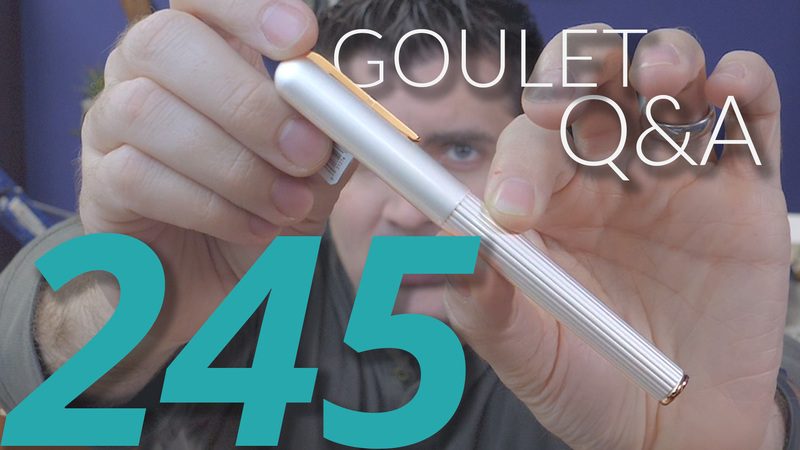 Would you ever branch off and start manufacturing your own line of true Goulet branded pens or inks? Not mixing ink up in the shop per se’ but having a 3rd party manufacturer make or mix them for you. As far as the pens goes I suspect something like how Nathan Tardif does with his pens being designed here but manufactured in India. I sometimes found ink on the back of the feed. If I left it alone the ink would accumulate. If I use the pen, I found that the accumulated ink would get lesser. This is in a matter of hours. Is this normal or something weird is going on? Pen in question is a Kaweco ICE Sport, my first fountain pen. Is it possible to grind/smooth a nib too much (to the point where the alloy tipping is ground right off)? If so, can anything be done about it? And if not, will the lack of tipping affect writing or will the nib itself be the same shape as the tipping by that point? 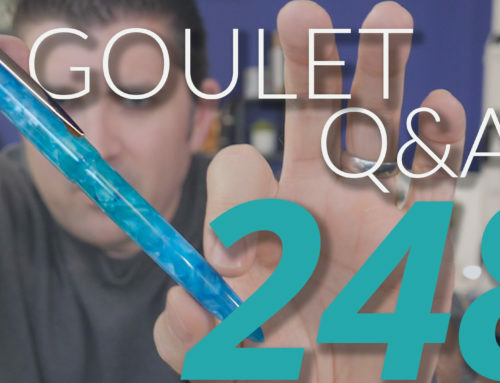 I love Goulet Pens Please continue being amazing. Now that freezing temperatures are here in Ontario, Canada, can I still order ink? Will ink freeze as quickly as water since it is water based? Are the Pilot/Namiki cartridges the same as the Mixable Color cartridge multi-pack? 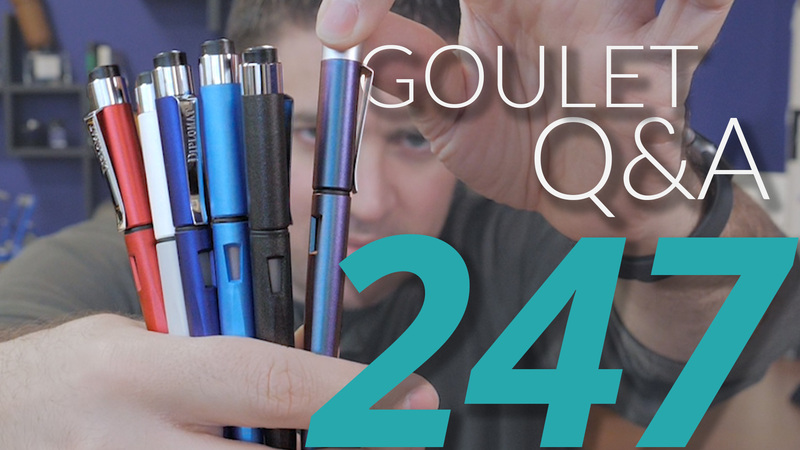 What are some other pen brands that you like where you may be trying to become a reseller? We already know that Mont Blanc is out of the picture for small pen dealers. Pelikan? Parker? Waterman? Related to this, will Sailor be coming back anytime soon or is their policy still “all our pens or none” ? I am new to Fountain Pens, (last Friday I got my first FP from you; jaw dropping customer service by the way), however, I’ve never seen on your videos addressing, guiding or advising new FP users on how somebody learns how to write cursive (only small tips here and there). I know how to write cursive, but now that I am using a FP, I wish to improve it so much more. From videos, to online guides, and books is what I am looking for, solid tutorials or guides. What would you recommend me (us)? Will we see the TWSBI Diamond 580 in white as rumored or will it remain an urban pen myth? 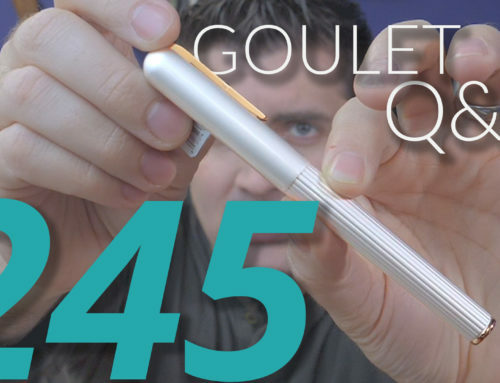 I’d like to know a bit more about Goulet’s relationship with Mr. Nathan Tardif. I’m a big fan of Noodler’s inks, and would also like to know if there are any plans for more joint projects like Liberty’s Elysium? It’s fantastic when companies can work together to make new and interesting products. Will you be able to get another interview with Nathan Tardif? Its been a while since your last interview and I would really love to hear of all the up and coming developments. Can you recommend some inks (or properties thereof) that would do well with EF & Accounting nibs? Some inks I’ve tried aren’t… dense? opaque? something? enough to be dark enough when using a EF nib. I’m using a Kaweco Sport EF on moleskine notebook. Mrs. Goulet any chances of starting a New old stock vintage or semi modern pens section? Or any chances of starting a semi vintage pens section? 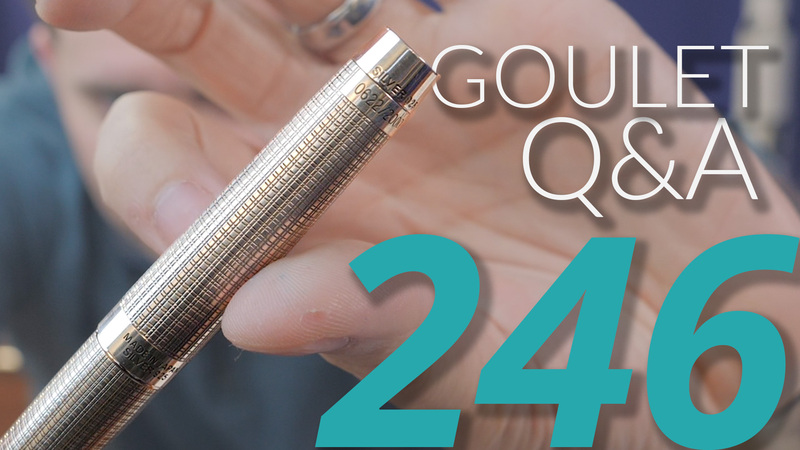 Next week, I’ll be discussing “Traveling With Your Fountain Pens”. A lot of us will be traveling to see family around the holidays this year, so be sure to ask me whatever questions you have about how to prepare, clean, store, and carry your pens and inks. 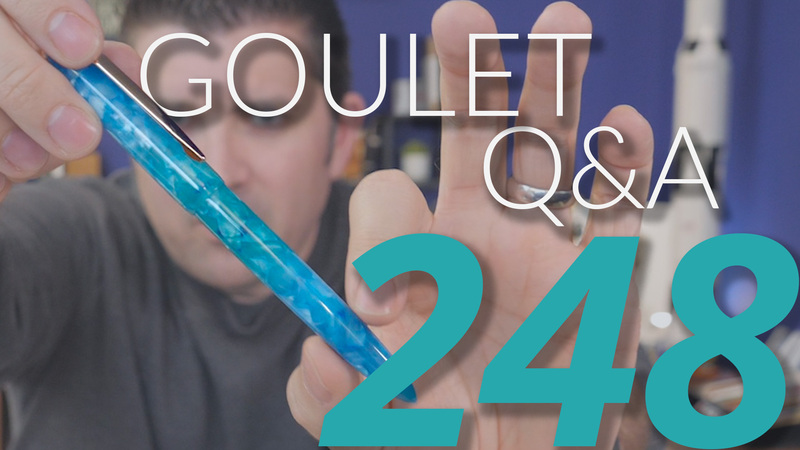 Leave a comment here, or email me at gouletQA@gouletpens.com to submit your question. Have a great week!